For anyone who loves sailing and adventure, Arthur Ransome's classic Swallows and Amazons series stands alone. Originally published over a half-century ago, the twelve books are still eagerly read by children and adults alike – by all those captivated by the world of adventure and imagination. Such longevity is not only due to Ransome’s unparalleled gift of storytelling, but also his championing of qualities such as independence and initiative; virtues that appeal to every generation, whether young or old. Swallows and Amazons, the book that started it all in 1930, introduces the Walker family, the camp on Wild Cat Island, the able-bodied catboat Swallow, and the two intrepid Amazons, plucky Nancy and Peggy Blackett. 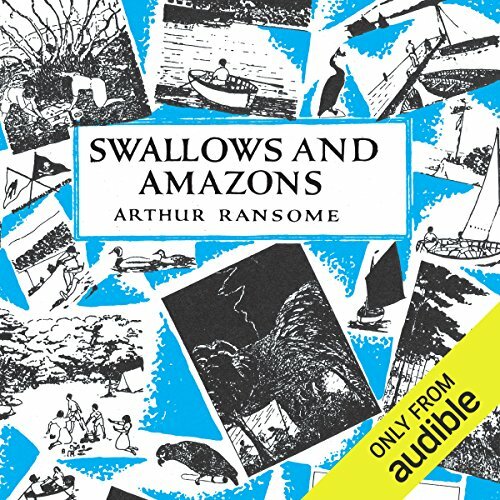 Swallows and Amazons is a masterpiece of children's literature, written by author Arthur Ransome and the winner of the inaugural Carnegie Medal in 1937. Set back in the time before overwhelming and constricting parental protection became practice, this book is about four children on their Summer holidays sailing on a Lake in the English Lake's District. With parents and other responsible adults far away, they engage in adventures in the sailing dinghy 'Swallow'. While sailing around this lake they make-believe a world of exploration where they are the explorers mapping the Lake. On their journeys they meet the Amazon Pirates, establish an explorer's camp on Wild Cat Island, fight a war and sail in the dead of night. This book is the first of a series of 12 books that take place on the Lake, the Norfolk Broads, and on the high seas and have capture the imagination of many children since their first publication in the 1930-50s. This book is perfect for children to read or have read to them and conveys the innocence of childhood imagination and adventure in such a way that many children would love to have a holiday such as this.